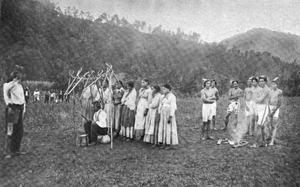 The Eastern Band of Cherokee Indians (EBCI), (Cherokee: ᏣᎳᎩᏱ ᏕᏣᏓᏂᎸᎩ, Tsalagiyi Detsadanilvgi) is a federally recognized Native American tribe in the United States of America, who are descended from the small group of 800 Cherokee who remained in the Eastern United States after the Indian Removal Act moved the other 15,000 Cherokee to the west in the 19th century. They were required to assimilate and renounce tribal Cherokee citizenship. The history of the Eastern Band closely follows that of the Qualla Boundary, a land trust made up of an area of their original territory. When they reorganized as a tribe, they had to buy back the land from the US government. The EBCI also own, hold, or maintain additional lands in the vicinity, and as far away as 100 miles (160 km) from the Qualla Boundary. The Eastern Band of Cherokee Indians are primarily the descendants of those persons listed on the Baker Rolls of Cherokee Indians. They gained federal recognition as a tribe in the 20th century. The Eastern Band of Cherokee Indians is one of three federally recognized Cherokee tribes, the others being the Cherokee Nation and the United Keetoowah Band of Cherokee Indians, both based in Oklahoma. Its headquarters is in the namesake town of Cherokee, North Carolina in the Qualla Boundary, south of the Great Smoky Mountains National Park. The Eastern Band members are primarily descended from about 800 Cherokee who did not participate in the Trail of Tears to Indian Territory (now Oklahoma). Principal Chief Yonaguska, with the help of his adopted European-American son, William Holland Thomas, managed to avoid removal. The Eastern Band of Cherokee Indians have maintained many traditional tribal practices. 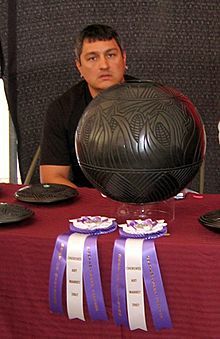 Many prominent Cherokee historians are affiliated with, or are members of the Eastern Band. Tsali (pronounced IPA: [ˈtsali]) opposed the removal. He remained in the traditional Cherokee lands with a small group who resisted the U.S. Army and tried to thwart the removal. Tsali was eventually captured. He was executed by the United States in exchange for the lives of the small band he protected. They were allowed to remain in the Cherokee homeland, with the condition that they give up Cherokee tribal citizenship and assimilate as US citizens. Their descendants reorganized in the 20th century and gained federal recognition as a tribe known as the Eastern Band of Cherokee Indians (named in reference to the majority of the tribe who moved west to Indian Territory in 1839.) They bought back land in what is known as Qualla Boundary, part of their traditional territory that had been ceded to the US government by other Cherokee leaders prior to removal. Their Museum of the Cherokee Indian exhibits an extensive collection of artifacts and items of historical and cultural interest, from the early Mississippian Period, of which there are remains in the area, to the Cherokee Culture brought by their migrants in the 16th and 17th centuries. They are an Iroquoian-speaking people related to those nations in the Iroquois Confederacy and other Iroquoian-speaking groups traditionally occupying territory around the Great Lakes. The Qualla Arts and Crafts Mutual, located near the museum, sells traditional crafts made by its members. Founded in 1946, the Qualla Arts and Crafts Mutual is country’s oldest and foremost Native American crafts cooperative. A stickball dance on the Qualla Boundary. 1897. More than two dozen Christian churches of various denominations are located within the Qualla Boundary. Many of the traditional religious practices of the Eastern Band have, over time, blended with new age views and customs according to Cherokee traditionalists. They have diverged as the result of cultural isolation of the various factions of Cherokee society. 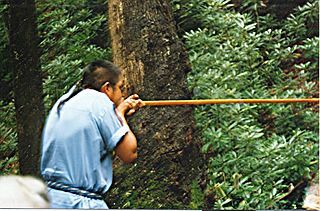 Many traditional dances and ceremonies are still practiced by the Eastern Band. The Eastern Band has begun a language immersion program requiring all graduating high school seniors to speak the tribal language beginning 2007. Of the total population in the Qualla Boundary, there are approximately 900 speakers, 72% of whom are over the age of 50. The Eastern Cherokee Indian Reservation, officially known as the Qualla Boundary, is located at in western North Carolina, just south of Great Smoky Mountains National Park. The main part of the reservation lies in eastern Swain County and northern Jackson County, but smaller non-contiguous sections are located to the southwest in Cherokee County (Cheoah community) and Graham County (Snowbird community). A small part of the main reservation extends eastward into Haywood County. The total land area of these parts is 213.934 km² (82.600 sq mi), with a 2000 census resident population of 8,092 persons. The Qualla Boundary is not strictly a reservation, but rather a "land trust" supervised by the United States Bureau of Indian Affairs. The land was a fragment of the extensive original homeland of the Cherokee Nation. The people had to purchase their land to regain it after it was taken over by the US government through treaty cessions. Today the tribe earns most of its revenue from a combination of Federal/State funds, tourism, and the Harrah's Cherokee Casino, established in the early 1990s. In 1988, the United States Congress passed the Indian Gaming Regulatory Act (IGRA), which allowed federally recognized tribes to establish casinos on tribal property. Under the act, tribes are limited to offer casino games that correspond to the existing level of gaming allowed under state law. North Carolina was unique in permitting the Cherokee to establish a casino offering Class III gaming, well before the state allowed a lottery. The typical pattern has been for states to offer a lottery, followed by an agreement between the state and the Indian tribe to allow establishment of a casino or other form of gambling operation. The first major casino in North Carolina, Harrah’s Cherokee Casino (in partnership with Caesars Entertainment Corporation), was opened on Qualla Boundary, land of the Eastern Band of Cherokee Indians in the western part of the state on November 13, 1997. The casino was the result of nearly ten years of negotiations among tribal, state, and federal officials. Tribal Chief Jonathan “Ed” Taylor, North Carolina Lead Liaison and Chief Negotiator David T. McCoy, and North Carolina Governor Jim Hunt developed a plan for a casino that would meet state laws and satisfy local and tribal concerns. Tribal leaders wanted to be able to offer more than bingo and other Class I forms of gambling, in order to attract larger crowds and generate greater revenue. The tribe had previously opened a small casino offering forms of video poker and electronic bingo. This had been challenged by the Asheville, North Carolina U.S Attorney on the grounds that the tribe was offering a form of gambling that was not legal elsewhere in North Carolina. The tribe wanted to ensure agreements with the state to prevent such problems. The tribe and Governor Hunt came to agreement: the casino would be allowed to offer electronic games that required “skill or dexterity” and with a maximum jackpot of $25,000; table games were to be prohibited; and alcohol was not permitted. One half of the annual casino earnings were to be divided among all members of the Eastern Band of Cherokee tribe as an annual bonus. Since the inception of the North Carolina lottery in August 2005, Harrah’s Cherokee casino has been permitted to extend its offered games to include Class II and III gambling. As thousands of people visit Harrah’s each year and the casino’s popularity continues to increase, the economic benefits of the casino have become evident. Annually, at least $5 million of casino profits is given to the Cherokee Preservation Fund; this institution pays for projects that promote non-gambling economic development, protect the environment, and preserve Cherokee heritage and culture. Another portion of casino profits goes to improving tribal health-care, education, housing, etc. Part of the revenue goes to the state of North Carolina, as provided by the agreement drafted by Taylor and Hunt. The casino earned $155 million in yearly profit in 2004, which yielded approximately $6,000 to each tribal member in that same year. On September 28, 2015, the Eastern Band of the Cherokee Indians opened a second Harrah's Casino in Murphy, North Carolina. Eastern Band of Cherokee Indians Facts for Kids. Kiddle Encyclopedia.